The PunchLight Solo USB is a small aluminium light unit which automatically indicates Recording start/stop and record "ready". The unit is powered directly from USB. No PSU or Midi Interface is needed! Supported applications: Pro Tools, Nuendo, Cubase, Logic Pro, Digital Performer, Sonar, Reaper, Vegas Pro. Size - 93 x 24 mm (3,6" x 0,95"). The biggest timecode display in the world - size 172 x 33 cm. The Relay SwitchBox USB is a small USB powered unit with two built-in switching relays. The unit can control any signalling systems already installed in the studio. You can control any other device, e.g. speakers, a microphone or even your own light system via just one small box. The Relay Switch Box USB can work without a power supply, as it is connected and powered via just an USB port. Compatible with Pro Tools, Cubase, Nuendo, Logic Pro and most other audio/MIDI applications. For when you need to see timecode precisely and independently from your monitor. The Studio Display USB greatly expands the features of the existing Timecode Display. In addition to timecode, the display can show bars&beats, time or samples. It is extremely slim and compact - 16 mm thin. Compatible with Pro Tools, Cubase, Nuendo, Logic Pro and most other audio/MIDI applications. The PunchLight Midi is an automatic switcher interface to connect up to three of the light units such as the RECORDING Display, RECORDING PlexSign, RECORDING Lamp or a RECORDING Strip. This box connects to any MIDI interface; it works in Pro Tools or in Cubase, Nuendo, Logic Pro, Samplitude and Digital Performer. The PunchLight GPI is an automatic switcher interface for connecting up to three light units at once, such as the RECORDING Display, Recording Lamp, RECORDING Strip or RECORDING PlexSign. This device connects to the GPI port on SYNC HD or SYNC I/O and works exclusively with Pro Tools HD, without any drivers. An AC 12V power supply is included. The Relay Extender is a new product, which takes the PunchLight product line into a new direction. You can control any other device for example speakers, microphone or even your own light system via one small additional box. It is very easy to connect it to an existing Midi Switcher Box or GPI ThruBox and automatically turn appropriate gear on or off. 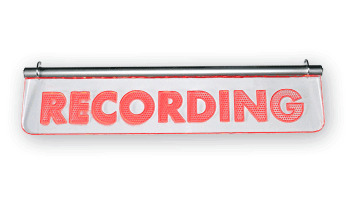 The Recording PlexSign is a brand-new uniquely designed light unit set in high-grade plexiglass. The illuminated letters are engraved using a high precision milling technique. Aesthetically stunning, it has the same functionality as the Recording Display. It can be connected to the GPI ThruBox or the MIDI SwitcherBox either of which act as a trigger.